This allows us to convert a penalty taken or drawn into a goal value. This method was also used in Dawson Sprigings’ WAR model (no longer available) as well as Emmanuel Perry’s K Model and WAR model along with various statistical modeling techniques. Offsetting penalties (strength state change of 5v5 → 4v4, etc.) are excluded as the net goal impact is equal to zero. Penalties that result in no strength state change are excluded (fighting majors, misconducts, etc.). Superfluous penalties are excluded (misconducts, “stacked” unsportsmanlike conduct penalties, match penalties, etc.). Penalties that lead to a goal during a delayed penalty situation are not recorded by the NHL and therefore cannot be measured or included. * All penalties taken or drawn during a powerplay or penalty kill. ** The NHL does not specifically record delayed penalty situations, which makes this type of penalty rather difficult to identify. If a team was able to pull their goalie after a penalty was called, the strength state when the penalty was recorded appears to be an empty net situation. We will address this later in the article. Using a goal value of 0.17 for all penalties is fair given the fact that it covers the vast majority of penalties taken or drawn. 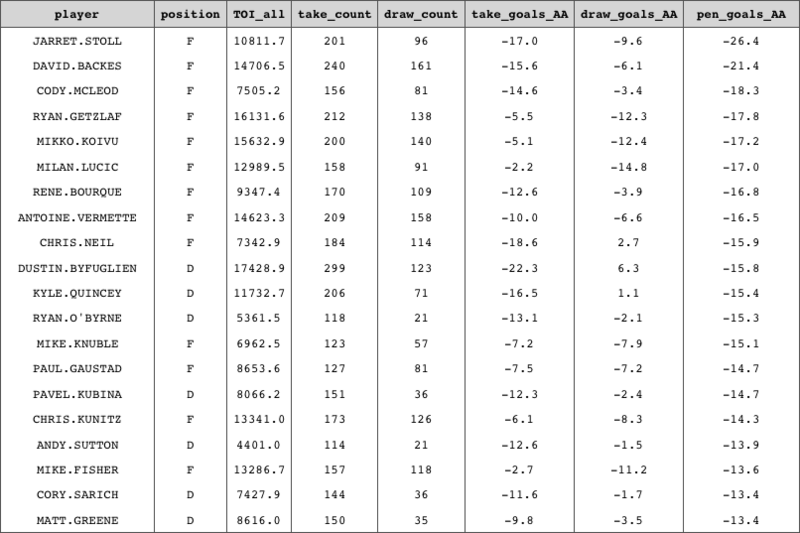 However, 25% of all penalties taken impact team goal rates in a different way. What about a penalty taken when shorthanded? What about a penalty taken during 3v3 overtime? These penalties often feel much more impactful – especially if, for instance, a player takes a penalty 5 seconds into a 4v5 penalty kill. What follows is our attempt to expand the 5v5 → 5v4 penalty goal value calculation to include the net goals added from penalties taken or drawn at (almost) every strength state. Note: This article was written between Dec 2017 and Jan 2019. Some of the data used spans ‘07-08 – ‘16-17 (10 years) and some data spans ‘07-08 – ‘17-18 (11 years). The years will be noted. We can now calculate the change in scoring rates for each strength state change caused by a penalty taken or drawn. 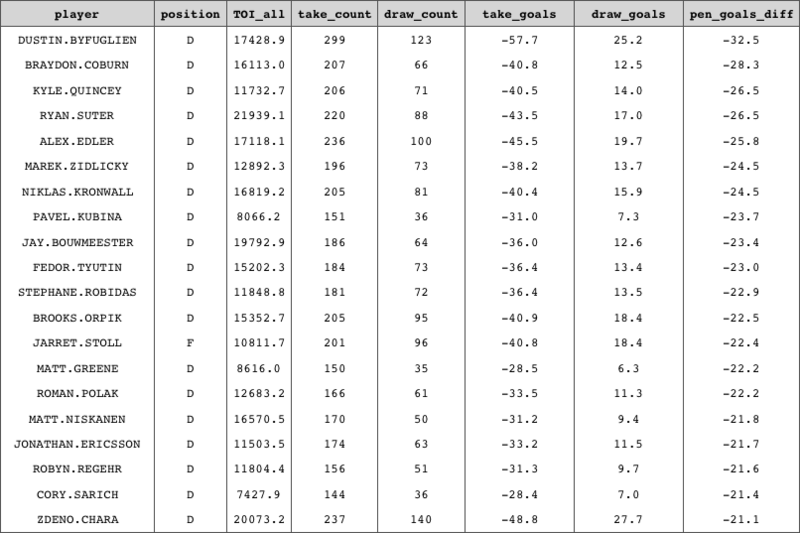 The below tables show the change in GF60 and GA60 from the state a penalty was taken (row labels) to the state in which the powerplay took place (column labels). The next strength state is determined using the strength state that was recorded during the faceoff that occurred immediately after the penalty was recorded. A strength state change that is not possible has a value of 0. * Empty net goals against are rather problematic as we have not (as of now) been able to accurately separate empty net and delayed penalty situations. It is for this reason that we will treat a strength change of 6v5 → 5v4 as 5v5 → 5v4 (and so on). Ideally, a delayed penalty would be recorded as the strength state immediately before the goalie was pulled (5v5) moving to 5v4, and a true empty net situation (not the result of a penalty) would be measured as 6v5 moving to 6v4 for GF60 and 5v5 moving to 5v4 for GA60. This value is assigned as a positive goal value to the player who drew the penalty and a negative goal value to the player who took the penalty. Rather than using the approximation of 1.8 minutes of powerplay time, we will be attribute the full 2 minutes for minor penalties (4 minutes and 5 minutes for double minors and non-fighting major penalties respectively). There is room for debate here. In our opinion, a player does not have control (or at least from a penalty-value standpoint) over whether that player’s team scores a goal (or allows a goal) in the ensuing powerplay/shorthanded situation. Initially we attempted to evaluate the length of ensuing states in a similar manner to WOI, but we found this to be not only a rabbit hole within the RTSS data but also unnecessary. A penalty is a penalty regardless of how a given player’s team performs after the penalty was taken/drawn. For double minors, the same calculation is applied, but the total penalty time that is used is 4 minutes (5 minutes is used for majors). All strength state changes still apply. For instance, on 12/15/16 Dallas’ Cody Eakin charged Henrik Lundqvist when the Rangers were 69 seconds into a 5v4 powerplay (video here). He received a 5 minute charging major. The goal value for this penalty would be calculated as follows: 69 seconds of 5v4 → 5v3 + 231 seconds of 5v5 → 5v4 resulting in a goal value of -0.546 that is credited to Eakin for taking this penalty. For players drawing major penalties, we calculate the value as if it were a minor penalty. This is mainly based on our view that the excessive goal value drawn in this situation is the result of the player who took the penalty doing something wrong and not the victim doing something right. In our opinion, the normal conditions for drawing a penalty are true, but the player drawing the penalty did not do anything additional to earn the extra 3 minutes of penalty time (additionally, referee discretion is involved). For double minors (of which almost all involve some sort of bleeding), we feel the ease with which one bleeds is a potential benefit in this situation. Thusly, we award the full 4 minutes of drawing a penalty to that player. For penalty shots, we will use a different approach. Rather than use the same calculation that was described above, we will credit a player with league average shootout shooting percentage (as determined here) – or 31.94% (goal value of 0.3194). For the player who took a penalty that resulted in a penalty shot, we will assign the basic 0.182 goal value. This is an observational decision as we believe penalties that lead to a penalty shot are more often than not the result of a player interfering on a back-check – and, thus, more of a team breakdown than a normal penalty. No data is available to accurately measure this, but we will not further “penalize” players for taking a penalty that results in a penalty shot. This is a somewhat subjective decision, but it is a rare occurrence – only ~30 out of the ~8000 penalties taken each year are penalty shots. There is room to explore this further. 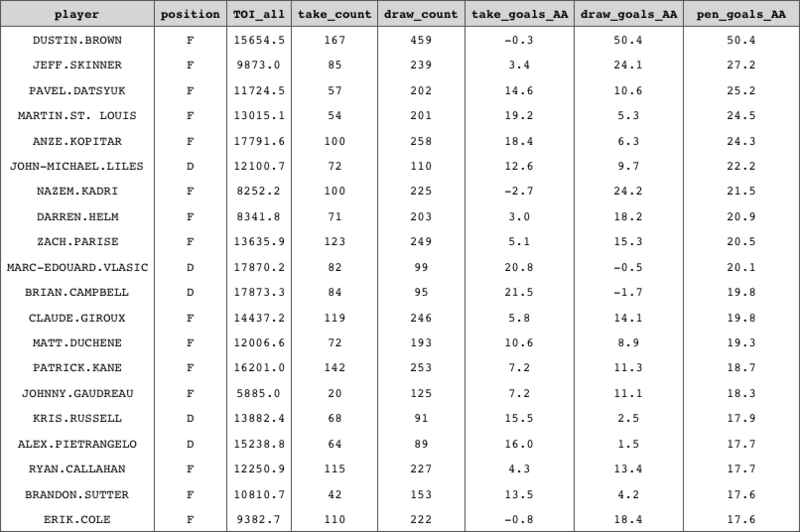 Now that the basic method and exceptions have been laid out, we feel it is important to cover one of the areas of penalty taking/drawing that hasn’t really been explored – something we’ll call penalty “clusters”. When working with the NHL’s RTSS data, we discovered situations where an abnormal number of penalties were taken in the same (recorded) instance while the strength state only changed from, say, 5v5 to 5v4. The normal practice when recording penalties at the player level appears to involve assigning the respective take and draw regardless of the impact the penalty actually had on the change in strength state. If penalty differential is what is being used, it appears that this is not impactful; however, when measuring takes and draws separately we feel it is best to accurately represent the real impact on strength state a player caused (hence why offsetting penalties are excluded entirely). Letourneau-Leblond minor for instigating drawn by Johansson. However, as the above totals show, this method was less than ideal for assigning penalties in these situations (Carlson and L.L. sum to the same value which does not make assigning the take possible). Initially, it appears the strength state should change from 5v5 to 4v3 – Letourneau-Leblond and Carlson took offsetting penalties (5v5 → 4v4) and Johansson drew an additional minor (4v4 → 4v3). However, that is not what happened. Players were fighting and misconducts were handed out… Honestly, we’re not really sure what happened here (or why the ensuing strength state was only 5v4). This happens somewhat frequently with these scenarios. Given how difficult it is to untangle these situations, we will be excluding them from the totals. There are instances, however, where two players take offsetting minors and one of the player takes an additional minor (putting the opposing team on the powerplay). This should behave like a 5v5 → 4v3 situation, but the offsetting minors act like fighting majors (no strength state impact). In these instances, only one take and one draw will be handed out (one take to the player who had two takes recorded and one draw to the player who had one draw recorded). The NHL has somewhat strange traditions when it comes to recording penalties. We are not sure why multiple minors need to be awarded when the actual strength state impact is that of one minor penalty being taken and drawn. Additionally, it appears that the conventions may have changed since the 2007-2008 season which complicates things further. We’ve attempted to account for these scenarios to the best of our ability. As a rule, if a penalty “cluster” situation is unclear it is excluded from the final total as to not adversely impact a player’s totals due to a recording error. This adjustment is applied equally to the penalty goal value for a player who took the penalty and the player who drew the penalty. For example, the penalty goal value of a penalty taken by the home team when trailing is be multiplied by 1.175 – this is assigned as a positive value for the draw and negative value for the take. This adjustment is applied equally for every strength state. There is room to further explore score and venue adjustments for powerplay and shorthanded situations; however, as discussed earlier, we found this too difficult to parse at this time. This may be revisited in the future. * simultaneous minors taken/drawn, .182 assigned for each. ** penalty taken 30 seconds into the previous special teams situation. Let’s look at the “leaders” over the past 11 seasons. Our hope was to complete this process for each strength state; however, TOI is also difficult to determine for the specific instances when the penalties were taken (due to the issues with delayed penalty situations). This is something we hope to account for in the future. Overall, we feel this penalty goals process is a much more accurate estimation of the “real” goals added from penalties for each player in the NHL. 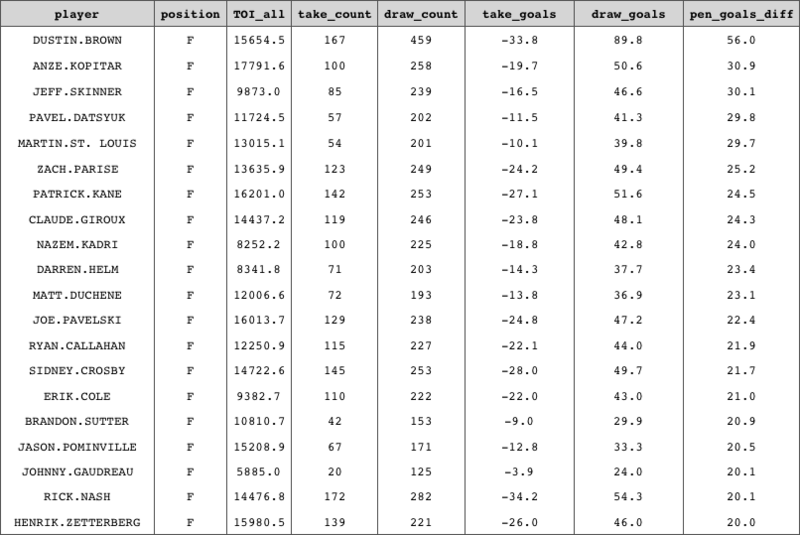 Additionally, centering each player’s rate of penalties taken/drawn around the positional mean allows for a much more interpretable final number. As we have noted multiple times, there is additional work that can be done. Others have explored various modeling techniques to measure a player’s value added from taking or drawing penalties (links throughout). These techniques could provide benefits in multiple ways, and we may explore this in the future. We feel the method we’ve covered here is a solid foundation for more accurately describing the value a player can add or subtract by drawing or taking penalties. All data can found be found on https://evolving-hockey.com, and all of our code (R) for this method can be found on GitHub here. Emmanuel Perry for his DryScrape NHL scraper – the NHL’s RTSS data was retrieved using the code available on his GitHub. A.C. Thomas, Emmanuel Perry, Dawson Sprigings, and JLikens for their previous work with NHL penalty data that was foundational in developing this method.